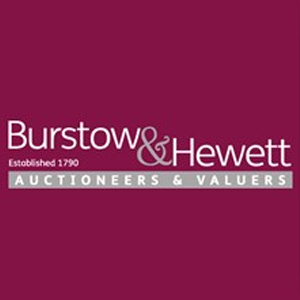 Burstow & Hewett are a family firm of qualified auctioneers and valuers established in 1790. The busy salerooms are based in two locations in Battle and handle a combined total of over 30,000 lots per year in 48 sales. The Abbey Auction Galleries are located in Lower Lake, Battle in what was at one time the Senlac Cinema. The building is strikingly Art Deco in appearance and retains some of the original cinematic features including tiered seating and a stage. The cinema itself closed in 1968 and was converted in to an auction rooms by the present owners. The salerooms are on the site of the battle of Hastings and part of the buildings were originally a debtors prison. Monthly sales of antique furniture, silver, jewellery, ceramics, metalware, rugs, garden statuary etc are held in these rooms. Special sales of paintings and prints are also held here every four weeks, making these the only dedicated picture sales in the South East, outside London.